The City of Montreal has been certified as a Blue Community, as part of World Water Day celebrations on March 22. To be certified, cities pledge to recognize the human right to water and wastewater services and to promote public management of water. Montreal joins about 40 Blue Communities around the world, including major cities like Paris, Berlin, Madrid and Victoria. “CUPE is proud Montreal has committed to ensure that its water services are – and will always be – a public good. Montreal is now the largest city in Canada to become a Blue Community and a leader in the fight to defend the human right to water,” said CUPE representative Mathieu Vick. The Blue Communities project is a joint initiative launched in 2009 by the Blue Planet Project, CUPE and the Council of Canadians. A Blue Community is a municipality that adopts a framework recognizing water as a common good that is shared by everyone and the responsibility of all. In Quebec, the project is coordinated by Eau Secours. Eau Secours is a non-profit organization founded in 1997. Its mission is to protect and responsibly manage water from the perspective of environmental health, equity, accessibility and the collective defence of human rights. Maude Barlow, world-renowned water activist and honourary chairperson of the Council of Canadians, presented the certificate. Since the campaign launched in Quebec four months ago, Amqui, Danville, Nicolet and Rivière-du-Loup have been certified as Blue Communities. Quebec alone accounts for more than 10 per cent of Blue Communities the world over. 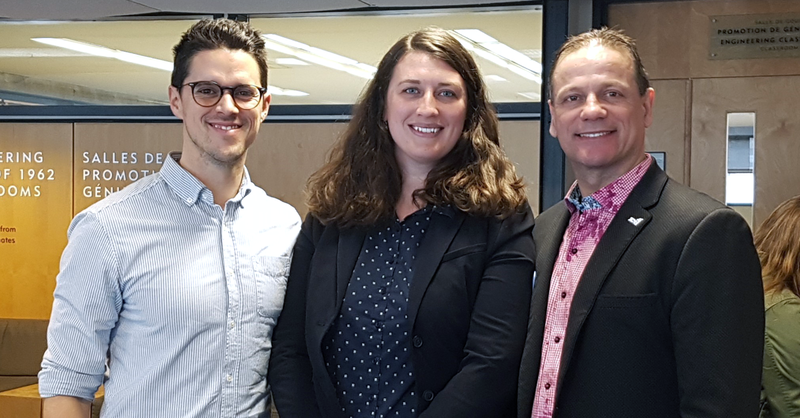 Photo text: Mathieu Vick, CUPE representative; Alice-Anne Simard, Eau Secours Executive Director; Luc Bisson, CUPE 301 member and Eau Secours board member.